Most of my designs are about flora and fauna, and the former in particular. Flora is a word of Latin origin referring to Flora, the goddess of flowers, and I am inspired by her. Nature is abandoned with colors, be those of flora or those of gem stones. 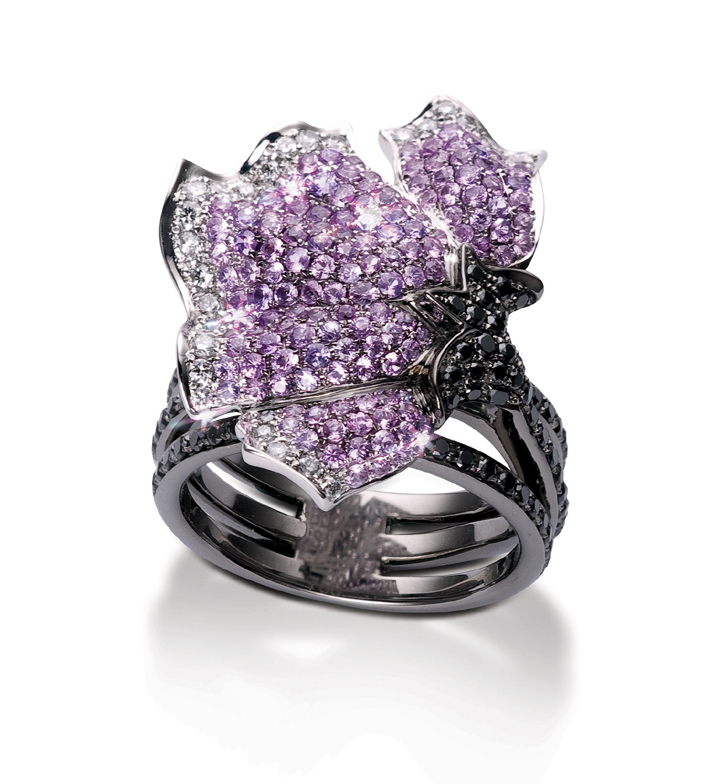 As a jewelry designer, I have to select the colors of gem stones to deliver the richness of flowers in nature. In order that my jewelries can touch the heart of my clients, they have to touch me first, in other words I have to be an expert in colors first! Colors are usually analyzed by three parameters: its hue, its saturation and its brightness. There are infinite numbers of hue. Take the primary hue of red and yellow for example, there is whole spectrum of hues between them and they are different oranges. It is the same between any two primary hues of the six (red, yellow, green, cyan, blue and magenta). For gem-stones, saturation is an important criteria, high saturation, in easily understandable terms, is the pureness of a color, like the color of a piece of new fabric. On the other hand, lower saturation is the condition of less pure, like the color of a piece of washed-out fabric. And finally, when you add black to a color, you decrease its brightness. In choosing the color of my gem-stones, I have to match its hue, its saturation and its brightness with my project on hand. An important consideration for jewelry design is the budget or the projected price of the piece, not always the most expensive being the best, nor that another cheapest stone that can deliver similar results will be chosen (like cheaper amethyst instead of more expensive sapphires), in particular for fine jewelry where a lady may be choosing a piece for its lasting and heritable value rather than its initial monetary outlay. Last but not least, a jewelry designer must be sensitive to the fashion trends in color and be able to spot the more lasting yet fashionable colors for her gem-stones. Pantone just published their 2013 Spring Fashion Color Report, and JCK (the organizer of the world number one jewelry show) selected my Endless Love ring set with purple sapphires (see below) to represent their Pantone 2013 Spring Color Report in Jewelry. African Violet (Pantone 16-3520), one of the ten selected Pantone colors for next Spring's fashion.